This can be a tough concept to grasp, but that's really what it does. Ask our customers and they’ll tell you all about it. 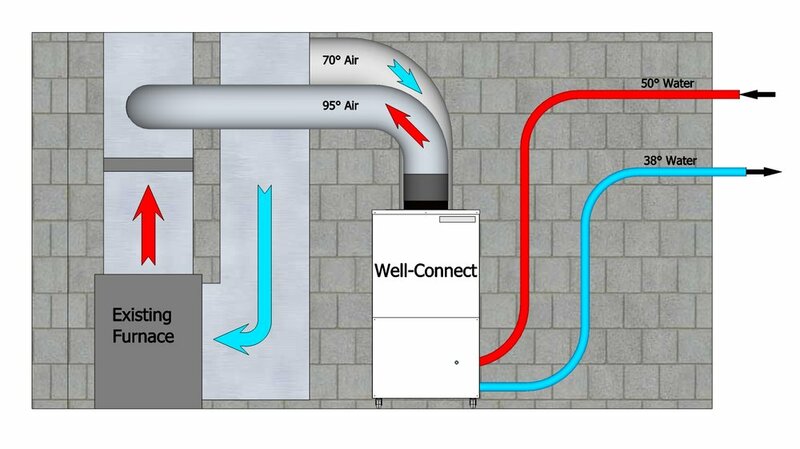 Well-Connect’s patented hybrid system is designed to operate simultaneously with your home’s current heat source, it does not replace it (see the image to the right). Well-Connect handles the bulk of your heating (and cooling) needs while your furnace kicks on during the coldest days to "top off" the heat in your home. Well-Connect is designed to supply almost all (70%-90%) of a home’s heating needs. The chart below shows the monthly heating load for a typical home during the heating season. The blue portion shows that Well-Connect supplies 85% of the total heating load. The red portion shows the home’s current heat source. It is secondary to the Well-Connect and only helps out on the coldest days. Contact us today to discuss how a Well-Connect can save you money!